You have received an email from a person with whom you have never interacted earlier and thus, before you take the conversation forward, you would like to do some research on the Internet to know more about that person. How do you do this without directly asking the other person? Google is the most obvious place for performing reverse email lookups (just Google for the email address) but if that person doesn’t have a website or if they have never used their email address on public forums, Google will be of little help. No worries. If you only know the email address of a person and nothing more, here are some ways that may help you uncover the identity of that unknown email sender. Open the header of the email message and look for lines that say “Received: from” and are followed by an IP address in square brackets. If there are multiple entries, use the IP address mentioned in the last entry. Facebook has a billion users and the likelihood is therefore high that the sender may also have a profile on Facebook. Unlike LinkedIn and most other social networks, Facebook lets you search users by email address so that should make your job simpler. Just paste the email address of the person into the search box and Facebook will instantly tell you if a profile exists with that email address or not. If you are able to locate that person on Facebook, download the profile picture and then upload it to Google Images (click the camera icon in the search box). This acts as a reverse image search engine so you can locate his other social profiles where he may have used the same picture. 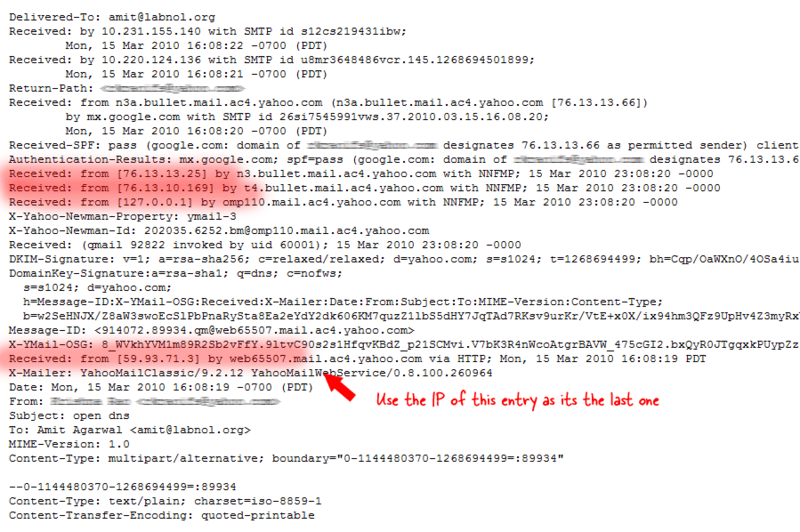 If the email address of the sender is something like green_peas@hotmail.com, there’s a probability that he or she may have created accounts of some other social network using the same alias “green_peas” – put that in knowem.com to confirm. Gmail users can install the Rapportive add-on and find the Twitter and LinkedIn profiles associated with an email address, if any of them exist. For details, see this tutorial on how to guess someone’s email address. Finally, if none of the above tricks work, you should try a people search service like Pipl and Spokeo – both services let you perform reverse email lookups but Spokeo has a more comprehensive database than Pipl.